Kent Nolt, SteinerZ programmer, works on two projects: a nest (left screen) made up of large and small parts for a laser setup, and a CAD drawing of a thermal exhauster unit. 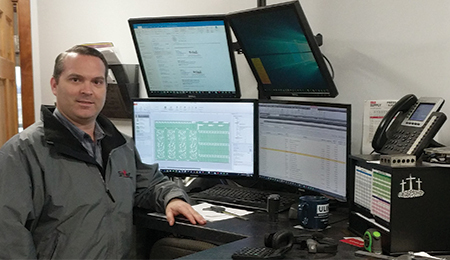 Titus Steiner, owner of SteinerZ, a Russellville, MO-based custom fabrication shop, is a quick study when it comes to nesting software. From the 2010 launch of his firm (spelled as an alternative to Steiners) in a 2800-sq.-ft. shop, to its present-day 14,000-sq.-ft. facility, SteinerZ’s use of ProNest CAD/CAM nesting software by Hanover, NH-based Hypertherm, has grown along with its output. SteinerZ started cutting parts with a single machine, a Trumpf 2600-W laser, which it sold in 2016. Today, using a Durma 6-kW fiber laser, an ACL Group 175-ton, 10-ft. CNC press brake and an Accurl 13-ft. by 1⁄4-in. CNC sheer, its work ranges from one-offs to 10,000-part orders for such applications as automotive, agricultural, thermal oxidizers, generators and commercial trailers. Custom-fabricated parts produced by SteinerZ include these jet exhausters for use on a charcoal kiln. “SteinerZ’s expanding use of nesting modules puts it squarely in the power-user category,” says Jason Michahlski, regional sales manager for Hypertherm, who sold Steiner the ProNest software in 2010, and has been working with him since. Automatic Nesting allows for efficient nesting at the click of a button. Chain and Bridge Cutting uses chaining to link parts in a continuous cut for fewer pierces, while bridging puts a thin web of material between parts for fewer pierces and decreased movement. Collision Avoidance reduces or eliminates the need for head raises by automatically adjusting the leads, traverse path and cut sequence for faster overall head-down motion. Common Line Cutting allows parts to share common edges. Data Sync adds and updates plates from an MRP/ERP system into its plate inventory. Nesting System Optimization, a more powerful type of automatic nesting, accounts for available plate sizes, remnants, etc., for efficient combination of parts and plates. Plate Inventory provides a database to store, track and utilize all available plates; data also can be imported from ERP/MRP. 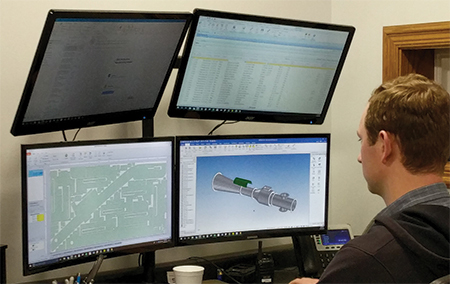 Production Manager connects nesting software to the shop floor, providing a window into machine status and job progress. Remnant Control defines irregular shapes for nesting. Skeleton Cutup enables simple removal of skeleton material from the table for recycling. Work Order Processing digitizes work-order travelers, used to track the status of operations, and which can be imported from ERP/MRP and combined for more dynamic nesting. Since launching SteinerZ in 2010, Titus Steiner has added significantly to his nesting capabilities via software modules that enable control of plate inventory and remnants, and provide for work-order processing and data synching for ERP/MRP integration. Such efforts represent the future of nesting, says Stillwell. “We’re going to see greater communication between machines, tying back to nesting software in powerful ways,” he says. While nesting optimization, remnant control, synching and other related efforts may seem technical and complex, Steiner offers that the software is intuitive and easy to learn. “If I need someone on the shop floor to cover for a programmer, he or she can learn to nest quickly, just after a few nest samples,” he says. “And, webinars and videos offer unlimited training opportunities,” says Stillwell.